I am pretty new to the game (my folks are level 15) and i am now in a phase where i try to "min max" my roaster. I spent some time on the forum and i would like to share with you my own understanding of what i read and tried to apply to my team mates. What i would like is to have your comments and feedback, to know if my understanding is correct and if indeed i should invest in them or not. 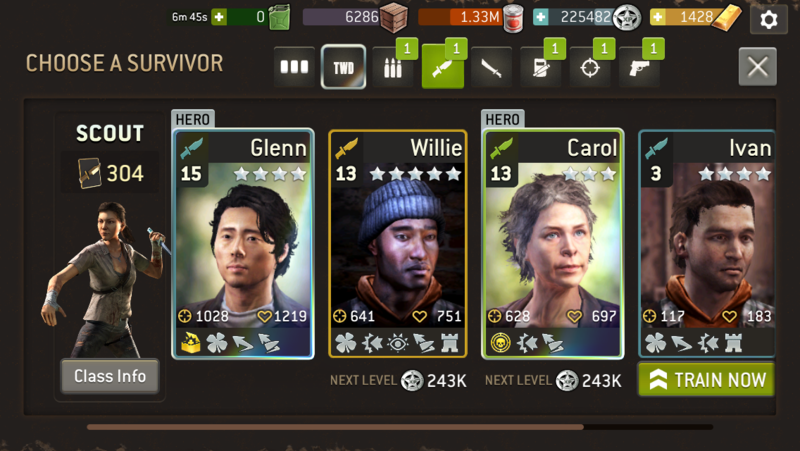 I use Glenn as leader when i farm. Willie : not so good traits. Vigilant and Retaliate is a bad combo. And Bullet Dodge is a waste ... It was my first scoot and i wrongly invested in him at that time. I still keep it for future descent but I do not invest in him anymore. Ivan : not so good either. i'm not very fortunate with radio calls. luck and dodge is very good. but i would like to have either iron skin, strong, and ruthless to go with it. Is it a correct statement ? Yvonne is pretty good to me. If as 5th traits she gets dodge or ruthless i consider she will be extremely good. Do you confirm ? To me she is worth investing in. Vernon is much better to me. Unfortunately He does not have dodge, nor Iron skin ... so he is a glass canon, but except for "sure shot" he has all the "damage increase" skills that exist. Equipped with a gun with "charging" then his charge attack is extremely damaging and he can almost do it every turn. I love him. I plan to invest in him and equip him with an "iron skin armor" to protect him a little. Would you consider it a good path forward ? I love Roy. with iron skin armor he is very solid. I am investing in him and he will most likely be my first pink star. Do you confirm he is a good choice ? 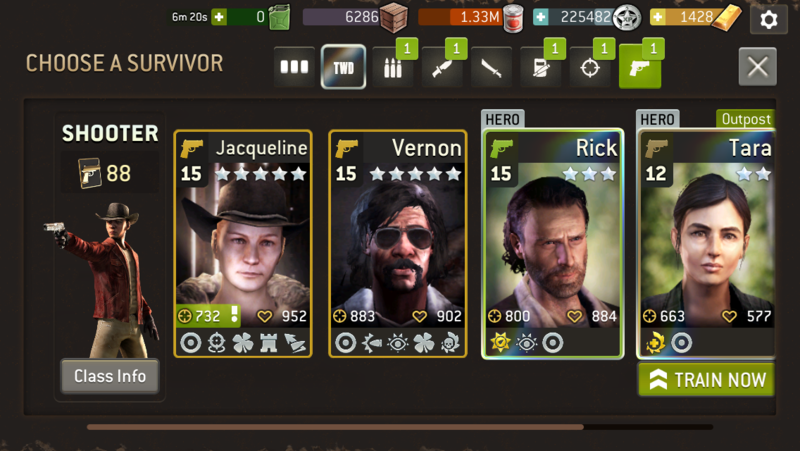 I keep Linda but she is like a mini Roy so i do not plan to invest in her. Tom is nice. A title bit like Vernon tho ... a glass canon. No iron skin. No dodge ... but i love his current skills. If as a 5th trait he gets either dodge, iron skin, or Luck, i would invest in him. Do you confirm it's a good choice ? Tim is good to me for keeping the vault, which he does very well. Do you share my analyses ? Both scouts are OK, but not perfect. 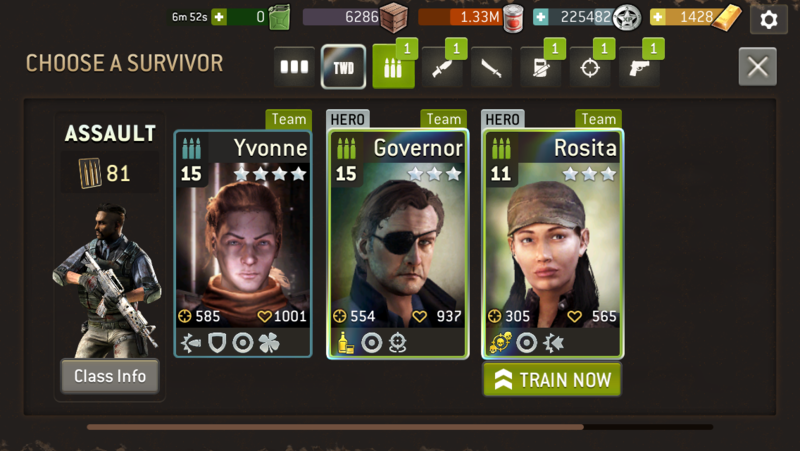 If Ivan gets Iron Skin or Strong as 5th trait, I would invest in him. I don't really like defensive stance, but it can be useful if paired with vigilant and iron skin with an interrupt weapon. Both shooters are pretty good. Jaqueline is missing dodge, as you said, but the combination of sure shot and marksman is very powerful. Vernon will be squishy if hit since he doesn't have dodge or iron skin, but can do lots of damage. Both are keepers. Bruiser - both are OK but not my preferred traits. 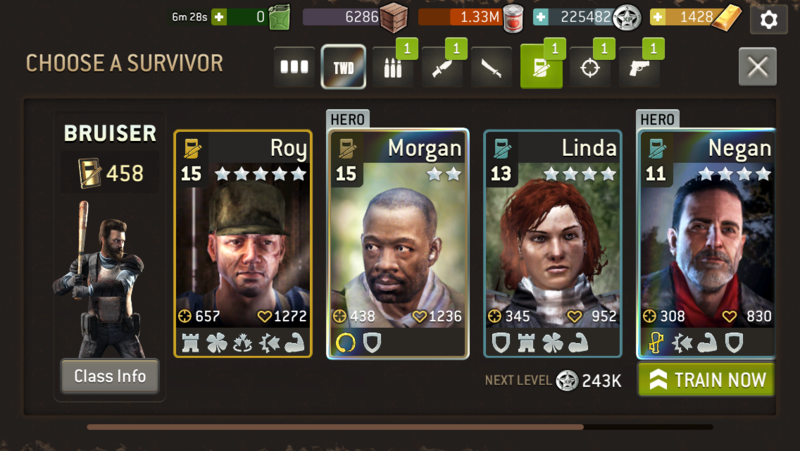 Roy is missing iron skin, which is almost a must-have for me on the bruiser class. Linda would have to get Retaliate for fifth trait for me to like her. Hunter - I would invest in Tom and hope he gets a great fifth trait. Even if he doesn't, he will still be a good killer. Sara has some good traits, like the Sure Shot/Marksman combo and luck, and is worth keeping until you find someone better. Christina is perfect for a warrior. I would love those traits on any melee class. Invest in her for sure. And unless you use warriors a lot, you can get rid of Tim and use those tokens for her. One regular warrior plus the heroes is more than enough. 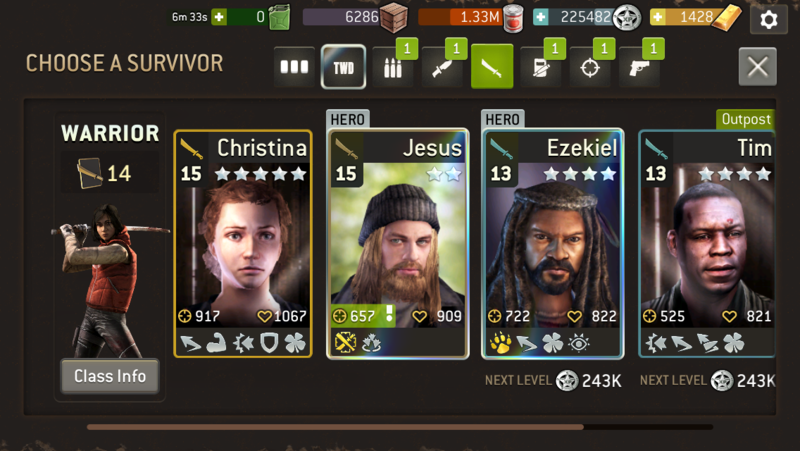 Jesus can be great once you are able to unlock his other traits and get him to Epic level. Scouts:Iron skin/strong/retaliate topped with dodge/luck/ruthless/powerstrike(?). 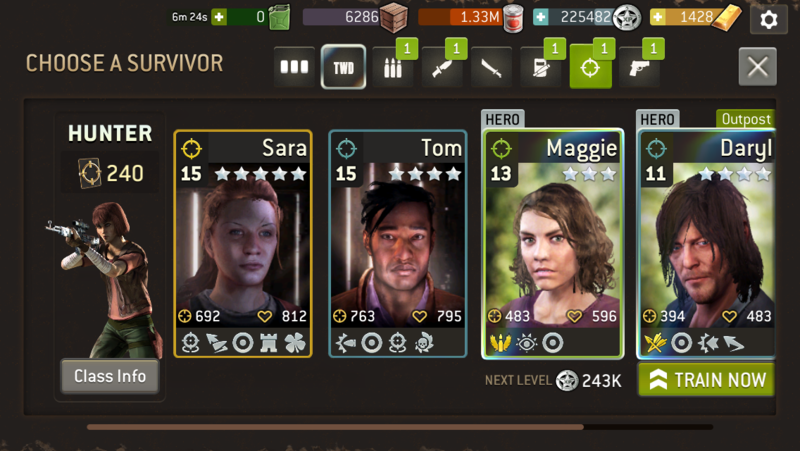 Scout without strong is not working for me, but you can replace that with badge/s now. Willie have 3 not good traits(though vigiland and def stance can be nice combo, but i would love to see other different traits than what he have), Ivan is way too big gamble just to end emptyhanded, I would not invest in him either. Keep and lvl up, but save tokens for better ones. Assault: iron skin/marksman needed, sure shot/dodge/luck will be best addition IMO. Some ppl like ruthless, I somhow accept it, if other 4 trait will be great. Yvonne can be fair assault with sure shot or dodge. Shooters: marksman/sureshot/iron skin is base, dodge/ruthless/luck will be fair addition, revenge or vigilant situational. Keep, but dont invest IMO. Bruiser: iron skin/retaliate/dodge/luck for starters. Punish is not bad, strong and power strike not needed but helpful. Again, keep and dont invest. Hunter: marksman/iron skin/sure shot, if followed by luck/dodge/ruthless, you dont need better. Revenge can help too.Tom with iron skin would be pretty decent. Warriors: Well, you hit jackpot with Christina. Solid base is iron skin/strong/retaliate, if followed by any of ruthless/dodge/luck/power strike, you can get pretty decent one. On top af that all. There are many builds not mentioned and some traits fit together with some others(vigilant+def stance) but that makes other traits(retaliate) absolute waste and these kind of combos are imo too situational. Think about them and make your choice, if u´ll be served with those. I pretty much like my hunter with iron skin/marksman/sure shot/ luck/vigilant, as he is perfect OW surv, I see my scout with iron skin/vigilant/def stance/luck/ruthless as very interesting build, but not yet decided if I´ll inest in her, see that as examples. Edit: Melee(valid for ranged too, but not that big issue for me) without luck tend to get stunned by fatties if not have luck on weapon, though they have gold stun resist, so better be careful with that. @glady : thank you for your comments. I'll do what you say. Keep those guys but do not invest in them, and wait for a stronger character.